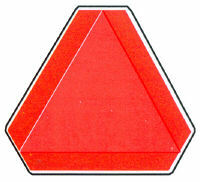 Used to alert motorists to your slow moving vehicle, meets American Society of Agricultural Engineers requirements. Our line of caution and warning signs can help prevent unnecessary accidents and lawsuits. Thick and durable, weather resistant. 13 3/4 X 15 3/4"